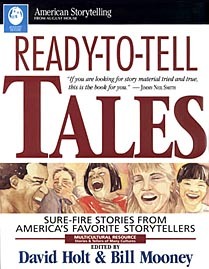 41 sure-fire stories collected from America’s best storytellers. Each story is ready to tell. Plus each teller has included tips for unlocking the story and telling it in performance. New stories for storytellers to tell, great stories for everyone to read. 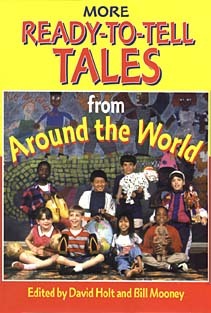 A multicultural resource with stories from Africa, India, ancient Greece, Egypt, Japan, the British Isles, Mexico, Thailand as well as the African_American, Cajun, Appalachian, Jewish and native American oral traditions.. When David Holt and Bill Mooney collaborated on their original Ready-to-Tell Tales in 1994, they knew they had a tiger by the tail. How do you top what School Libray Journal called a “highly recommended…extraordinary collection”? Here are some stories from the books. In l971 I was on a music tour of the Far East for the U.S. State Department. We spent several days in Chiang Mai, Thailand performing and meeting the people. At this time the Thai people were afraid the Vietnamese were going to overrun their country and everyone was on edge. I heard this simple yet powerful story from a young boy who was our unofficial guide around Chiang Mai. He said, “The story gives us courage.” The song in this tale is a melody the children in Thailand use to taunt one another. Since that time this story has found a life of its own in the storytelling community. I am glad to see it is being told. The hunter walked and walked until at last he came to a tree with a beautiful golden bird sitting in the top. (audience mimics and repeats: nah, nah, nah, nah,nah,nah,nah). (Teller and audience sing song with hand over mouth to give muffled sound). Now the hunter was furious. He grabbed his shovel and dug up every piece of the bird and put them in a little wooden box, and tied a large rock across the box with some rope. He went down to the river and threw the box as far as he could out into the water. It splashed and went straight to the bottom. He stood on the bank waiting to hear the sound of the bird. He heard nothing, so he went home. At the bottom of the river, the water loosened the rope around the box. The rock fell off and the box floated to the top of the water. It drifted along the river for three days. On the third day, the box floated by some children who were playing on the banks of the river. They saw this beautiful wooden box passing by and they wanted to know what was in it. They waded into the water and brought the box to shore. Telling tips: This story is easy to tell and always works. Although the tale is aimed at children, adults respond to the powerful ending. I usually start out by reminding the audience of our own cultural taunting song. Then I demonstrate how the Thai people sing their tune and get the audience to sing along. You could then mention where you got the story and then launch into it. Throughout the story when the bird sings his song I usually sing the tune first and then motion to the audience to sing it again with me. Some of the singing has a gesture with it, such as shivering or covering your mouth. The audience will quickly catch on and follow your lead. Classical composer Carl Orff has arranged a version of this story for the Orff insturments. He added the clap at the end of the tune which I have included in my version as it rounds out the melodic timing and brings the audience together. Once a poor, but hardworking woodcutter was walking home from the forest, with an ax strapped to his back. Suddenly he came upon a large old pot made of brass. It was the biggest pot he had ever seen. “What a fine pot!” he exclaimed. “But how will I get it home? It’s too heavy to carry…Wait, I know…” He untied his shoulder strap and dropped the heavy ax into the pot. He proceeded to tie one end of the strap through one of the pot’s handles and the other end around his waist. Then he began the hard work of dragging the clumsy pot down the path to his small house. The woodcutter’s wife was most pleased to see the pot and said, “What a fortunate day, husband. You found a wonderful old pot and another ax. “But there are two axes in the pot,” she said. The woodcutter looked inside and was speechless. Two identical axes sat side by side. As he leaned down to pull them out, his straw hat fell from his head and into the pot. Now two hats rested near the axes. The handful of coins doubled. They placed the coins inside repeatedly, and the amount doubled each time. An hour later every jar, pan, basket, pocket, chest, shelf, and shoe they owned was filled with money. They were, indeed, rich! Then he grabbed her around the waist and began to dance around and around the small room. Suddenly he slipped on some loose coins and accidentally dropped his wife into the pot! He tried to pull her back out–but it was too late. He now had two wives. They stepped out of the pot and looked closely at each other. It was impossible to tell them apart. “Not in my house,” said the first wife. “Not in my house,” said the second wife. Both women smiled and grabbed the woodcutter and made him get into the pot. Two woodcutters climbed back out. “Can two families live in the same house?” asked both of the men. “No,” said the first wife. “No,” echoed the second wife. Half the money was given to the second couple and they built an elegant house. It was right next to the first couple’s fine, new house. Ever since that time, the people of the village have remarked on the strong resemblance of the woodcutter and his wife’s new relatives, the ones who must have brought them all that money! Once a long time ago, when stories walked and animals talked, the alligators had beautiful smooth golden skin. They had the easiest life of all the creatures. During the day they swam around the swamp, fishing and eating. When they got tired of that, they would sun themselves on the banks, or chase rabbits for a snack. If it got too hot and tiring for them, the alligators would slide down into the water and cool off. One hot summer day when all the alligators were lazing in the water, Rabbit came hopping along the bank. You see, not long before, he’d had his tail bitten off by these same alligators. And he was coming to pay them back. So he started singing like he didn’t have a care in the world. “‘Cause if you don’t know Trouble, you don’t know life. “Oh, I can tell you about Trouble. I’ve seen it lots of times,” said Rabbit. “Or narrow as a sliver. “Or small as a fly. “Well, lemme think… You and all your family meet me in the center of the hay field in the morning. So all the alligators gathered on the banks and started off. They were laughing and singing, running and playing. It was the finest jamboree of alligators that the creatures in the swamp had ever seen. Big ones, little ones, long ones, short ones all parading to the hay field, their golden skin shining in the sunlight. Rabbit was waiting there to meet them. So the alligators all bunched together in the center of the field where the grass was high and the grass was dry. In the meantime, Rabbit hopped off to the far corner of the field. He pulled out a kitchen match and started a fire in the grass. Then he hopped off to another corner of the field and lit another fire. In no time, he had fires burning all around the edge of the dry hay field. The fire moved closer, and the fire got hotter. “MY, my, my, it’s warm and rosy. And the fire got closer, and the fire got hotter. “My, my, my, isn’t Trouble hot. And the fire got closer still, and the fire got hotter still. “My, my, my, it’s biting me. The alligators jigged to the left and they met fire. They jigged to the right and they met more fire. They jigged forward, and they jigged backwards, but there was fire all around. Then the King of the Alligators hollered, “Follow me.” He lowered his head and plowed through the burning grass. All the other alligators followed along behind him. Each alligator scrambled through the burning grass till at last they reached the banks of the river. One by one they slithered off the bank and flopped into the water, sizzling and crackling as they hit. Aah! That water was co-o-o-o-o-ol and ca-a-a-alm and comforting. Yessssir. They were HOME. As they lay in the water feeling good, the alligators looked around at each other. Their smooth golden skin had turned dark grey-green, all covered with cracks and ridges and still smoking. And to this day, the alligator has remained near the water ever since, so he can cool his rough cracked skin and stay away from Trouble.